I saw this on Tapatalk funny pictures, sounds like what the left is trying to do. Surprised the libtards haven't taken it up in their demonstrations. By Joe..... I believe he's got it! Actually, they did try their tactics to stop drunks. It was called prohibition. We all know how that worked. 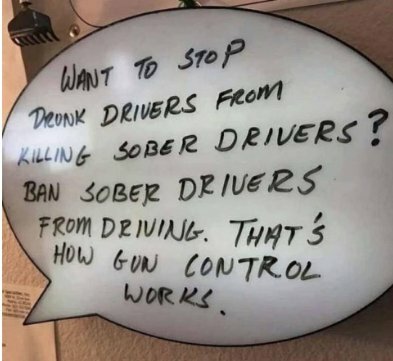 Only law abiding citizens went without booze & made criminals out of some that would otherwise be law abiding. Surprised conservatives haven't pushed that analogy much more often. So that's why AOC is trying to ban fossil fuels...to get our guns. Remember AOC is young! Someday she will be an old fossil. At that time if she is squeezed hard enough she will expel a fart, AKA methane gas. So what goes around, comes around.